In much of the world, moving from place to place is a common experience. For children, it can be strange and exciting: there may be “new” things to see and do, “new” people to meet, “new” cultures to encounter, “new” languages to learn,“new” foods to taste. For some, it’s a world of wonder and imagination. 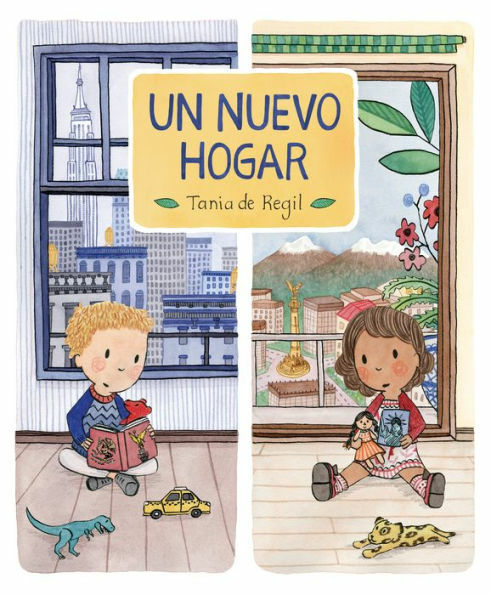 Told in a single narrative accompanied by complementary illustrations of a young boy who is moving with his family from New York to Mexico City and a young girl who is moving with her family from Mexico City to New York, Un Nuevo Hogar and A New Home are a straightforward and gentle discussion of what it may be like for a child to relocate and acclimate to a strange place. De Regil’s artwork, rendered in ink, colored pencil, watercolor and gouache, feature different palettes—mostly blues, grays, and yellows for New York City, and browns, reds and greens for Mexico City—that lend complexity and merit to the simplicity of a well-told story. As well, in the airport scene, where both the boy and the girl and their parents (he is holding a teddy bear and she is holding a Mexican peasant doll) briefly encounter each other, it’s refreshing to see the natural interaction among people of differing ethnicities and skin tones. Each spread holds both similarities and differences for young children to observe and ponder. In one spread, for instance, the streets in both cities feature musicians, tail-wagging dogs, and taxis. Both moms wear ponytails and both grandmas wear eyeglasses. The girl waves to one musician and the boy smiles at another; the boy waves to a snack vendor and the girl smiles at another. 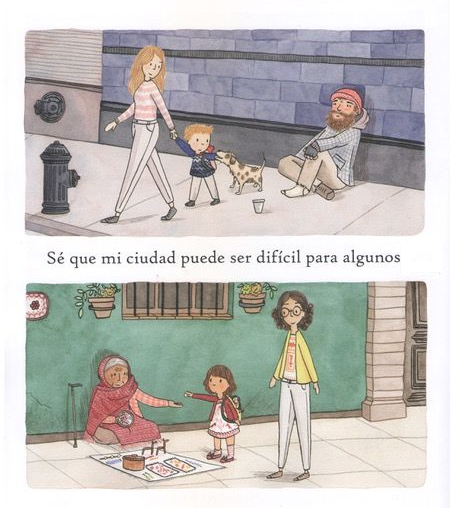 As well, observant younger people will notice challenging issues in both cities—such as poverty and homelessness—with empathy: “Sé que mi ciudad puede ser difícil para algunos.” (“I know that my city can be difficult for some.”) While their moms look on approvingly, the boy pets a destitute man’s dog and the girl gives a coin to an elderly woman on the street. © 2019 by Tania de Regil. Reproduced by permission of the publisher, Candlewick Press, Somerville, MA. On one spread, for instance, the two children are thinking about some of the things they will miss on their way to school in the morning: listening to the street musicians playing their favorite music; and on their way home in the afternoon, stopping to get a delicious snack from a street vendor. However, adults who present this little book as a “travelogue” will be missing the point and losing an opportunity. For older readers, there’s a helpful section of thumbnail illustrations and text that provides historical and cultural information about the peoples and places encountered by our young newcomers—as well as a brief, accurate and age-appropriate discussion of poverty and its causes in both cities. Since this lovely little book portrays the newness of relocating through the eyes of two young people with the same initial worries, I would like to have seen it as a bilingual flip book. Maybe next printing. Un Nuevo Hogar and A New Home are highly recommended.